My tasty wrap ingredients. Image by writer. I have been searching the CBD for a healthy, alternative lunch for awhile with limited success. I am a bit over the Food Courts, the fast food giants and the standard lunch places serving up rolls or sandwiches. 1. Pitta bread – less carbohydrates and healthier than white bread. I have found Mountain Bread quite good - made in Australia, quite thin, and comes in a few different types. 2. Hummus- I use as a spread as an alternative to butter. Made from chickpeas blended with tahini, olive oil, lemon juice, garlic and salt. 3. Avocado- good source of fibre, potassium, and vitamins C,K, B6 and folate. Also great on crumpets with Vegemite. 4. Tomato- rich in enzymes and antioxidants, which help fight free radicals in the body. 5. Beetroot- I actually buy it raw in the shop, spray with some olive oil then bake it in the oven. One of the healthiest vegetables around. 6. 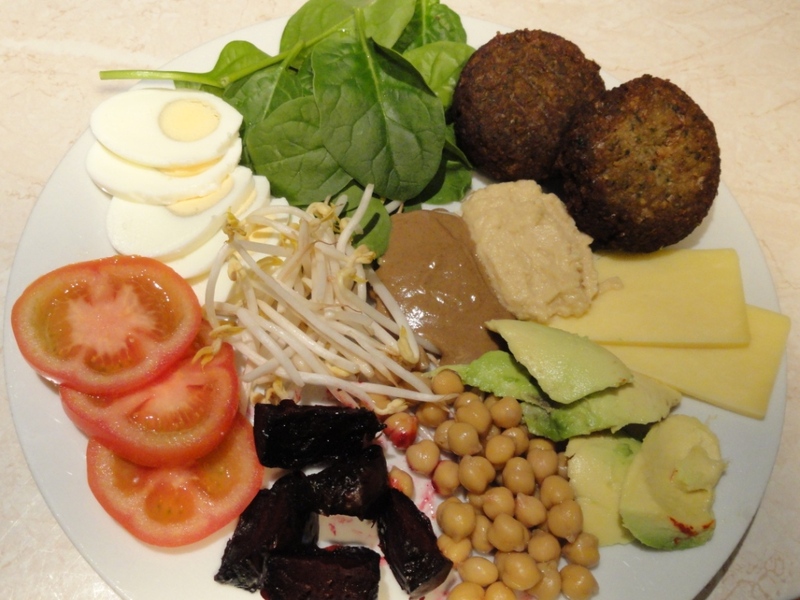 Falafel- this adds some texture and gives the wrap some crunchiness. A deep-fried ball or patty made from ground chickpeas, fava beans or both, with cumin, coriander, parsley and garlic often added for flavour. You can buy from a gourmet food store, I use only one (costs about $2-3) cut into quarters. 7. Chick peas- these are in the hummus and falafel anyway, but I add some straight out of the can for extra crunchiness. 8. Spinach leaves- I use the flat-leaf type, a good source of iron, anti-oxidants, vitamin B6 and folate. 9. Tahini- A paste commonly added to Falafel made from ground, hulled sesame seeds used in North African, Greek, Turkish, and Middle Eastern cuisine. 10. Bean sprouts- a legume, traditionally made from the green-capped mung-bean. Other common bean sprouts are the normally yellow, larger-grained soy-sprouts. 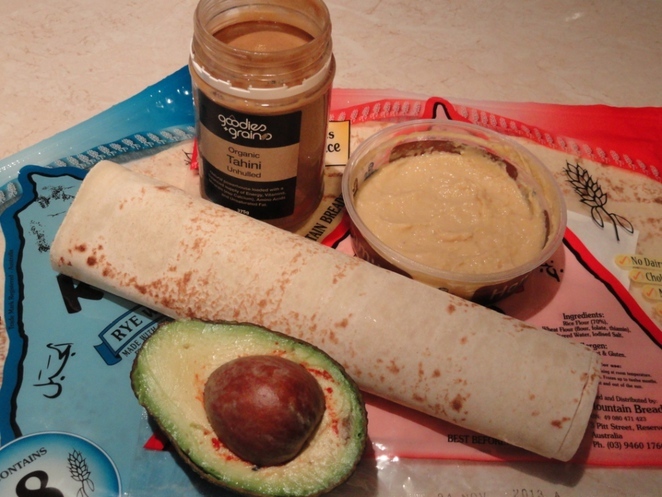 The spreads and pitta bread. Image by writer. I sometimes add cheese and egg, but this is probably going a bit over the top. Warning: You may need to use two sheets of Mountain Bread, as wrap may not be structurally sound. 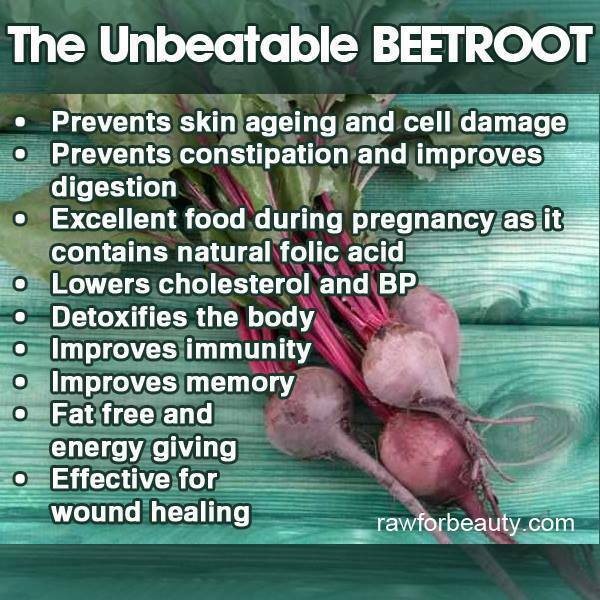 The benefits of beetroot. Image courtesy Raw For Beauty website. Do you have a favourite healthy lunch or eatery? Please add a comment. This would have been an enjoyable article to write James! Try Vegie Mamma in Mount Lawley. Delish vegetarian foods and great coffee.